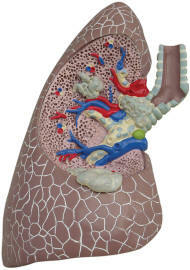 Life-size cutaway anatomical model of the of right lung shows bronchus, arteries, vein, two lymph nodes, bronchial passages and trachea bifurcation. 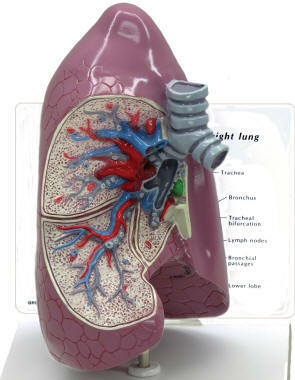 Comes with removable base and patient information card. 4.25 x 5.25 x 8.25 inches. 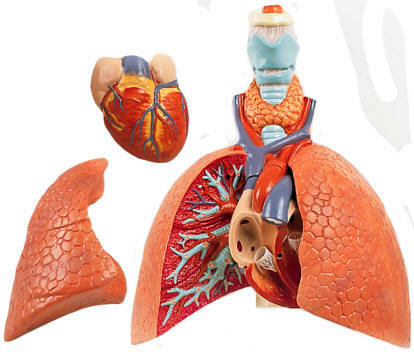 This life-size model shows the following features: larynx, trachea with bronchial tree, 2-part heart (removable) vena cava, aorta, pulmonary artery and esophagus. 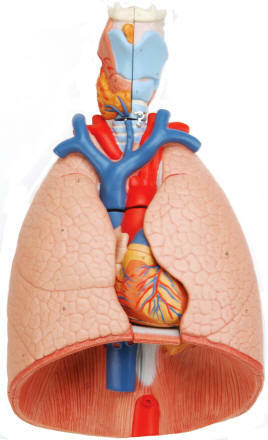 Front halves of the 2-part lungs are removable. Comes mounted on baseboard. 12 x 28 x 37cm. 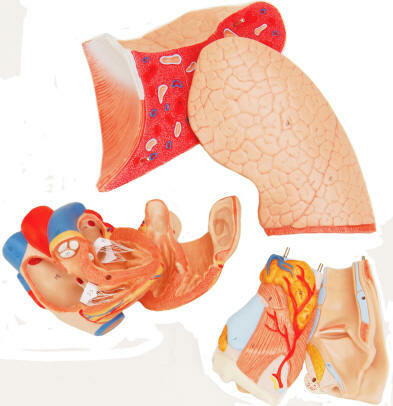 This first-class anatomical model of the lungs contains the following removable parts: 2-part larynx, trachea with bronchial tree, 2-part heart, subclavian artery and vein, vena cava, aorta, pulmonary artery, esophagus, 2-part lung (front halves are removable) and diaphragm. Comes mounted on baseboard. 31 x 41 x 12 cm. 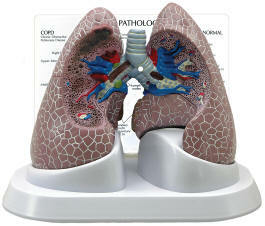 Life size 2-sided model of two separate lungs with 4 cutaway sections illustrating four conditions: (1) normal, and the effects of (2) fects of COPD (Chronic Obstructive Pulmonary Disease), (3) lung cancer and (4) asthma. 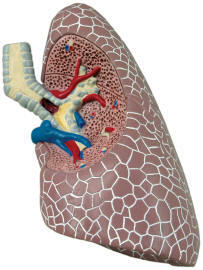 Both lungs come on an attractive base with information card. Size 4-1/4" x 5-1/2" x 8-1/4"